We are continuing our blog with a review of cell death assays for drug discovery. In this posting I will describe the most simple and useful assays to use in your project to measure cell death. All assays in our blog are available as a service from Alera Labs. As we have discussed in the first part of the series dedicated to cell death assays there are two major pathways for cell death: apoptosis and necrosis. The release of cell contents. No effect of the test compound on cell death. Non-lethal effects such as effects on proliferation, senescence, starvation, mitochondrial respiration, and contact inhibition. Cytotoxity – cell killing or non-lethal effect caused by chemical compounds or other cells. For example, cytotoxic T-cells can form pores in the membrane of the target cell disrupting membrane integrity and causing cell lysis. This form of cell effects can be distinct from apoptosis and necrosis by virtue of using cellular pathways not involved in triggering of classic apoptosis or necrosis. There are several classic cell death assays that detect molecular markers of apoptosis and necrosis either directly or through surrogate viability markers. These assays are relatively simple, accurate and cheap and are appropriate for primary screening of your compounds or conditions. Because cells are considered dead when plasma membrane has lost its integrity, exclusion dyes which cannot cross intact plasma membranes provide convenient way to discriminate between live and dead cells. Only dead cells, with disrupted plasma membrane, will be labeled by exclusion dyes. Classic example is Trypan Blue dye used to access proportion of dead cells in cell culture. exclude certain dyes, such as trypan blue, Eosin, or propidium, whereas dead cells do not. determine whether cells take up or exclude dye. The size of the aliquot depends on the approximate number of cells present. The aliquot should contain a convenient number of cells to count in a hemacytometer when suspended in 10-20 ul of PBS or media and then mixed with equal volume of 0.4% Trypan Blue dye solution (available from Sigma or GIBCO/Life Technologies, and others). Mix 1 part of 0.4% trypan blue and 1 part cell suspension. Use 10-20 ul of Trypan Blue dye and 10-20 ul of cell suspension. Allow mixture to incubate 3 min at room temperature. Cells should be counted within 3 to 5 min of mixing with trypan blue, as longer incubation periods will lead to cell death and reduced viability counts. Apply a drop of the trypan blue/cell mixture to a hemacytometer. Place the hemacytometer on the stage of a binocular microscope and focus on the cells. Count the unstained (viable) and stained (nonviable) cells separately in the hemacytometer. To obtain the total number of viable cells per ml of aliquot, multiply the total number of viable cells by 2 (the dilution factor for trypan blue). To obtain the total number of cells per ml of aliquot, add up the total number of viable and nonviable cells and multiply by 2. The protocol above should give you an idea of how robust and simple this assay is. General limitations of dye exclusion tests are discussed by the end of this post, but let me mention a couple of tips that resulted from our experience with this type of tests. Trypan Blue dye tends to readily bind to plasma proteins. So if your cell suspension has serum or protein and you see artefactual staining patterns then washing and resuspending cells in PBS should help to resolve the problem. Prolonged incubation with Trypan Blue would also increase the chance for artefactual staining, which means that the assay is better performed promptly. Finally, while human eye is a perfect instrument, assessment of Trypan Blue staining by eye could not detect subtle staining of cells by the dye. 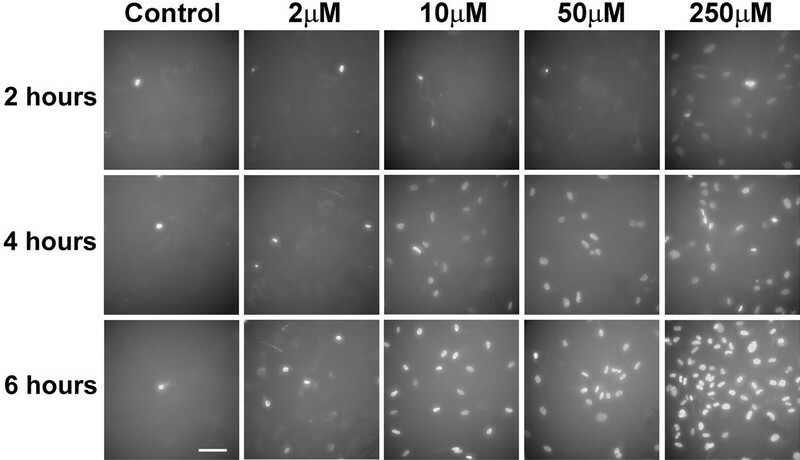 As a result, Trypan Blue assay usually gives underestimation of cell death when compared to fluorescent exclusion dyes detected by fluorescence microscopy. There are many commercially available fluorescent dyes that can be used for the dye exclusion assay. They provide a range of useful qualities that can be used to quantify both dead and live cells. For example, Hoechst 33342 and Acridine Orange dyes will stain BOTH viable and dead cells, while Hoechst 33258, DAPI, Ethydium Bromide, and Propidium Iodide will stain ONLY dead cells with compromised membrane integrity (most of these dyes will also robustly stain nuclear DNA but that’s a good topic for another article). Conversely, fluorogenic esterase substrates such as Calcein-AM can be used to selectively label viable cells because these non-fluorescent compounds penetrate BOTH living and dead cells, but only living cells are capable of converting these substrates into fluorescent products that are then retained only by living cells. DAPI and Propidium Iodide (PI) are the most popular fluorescent dyes for flow cytometry or automated fluorescent microscopy to perform fluorescent exclusion assay to label dead cells (Figure 1). Figure 1. Increase in proportion of dead neurons after treatment with cytotoxic compound Thimerosal. Thimerosal (sodium ethylmercury-thiosalicylate) is an antibacterial and antifungal mercurial compound used as a preservative in biological products and vaccines. Increased Thimerosal concentration or incubation time lead to an increased proportion of cells with compromised plasma membrane. Live cells were incubated with DAPI (Sigma, St. Louis, MO) diluted in a cell culture medium at a final concentration of 100 ng/ml for 30 min at 20°C. A fluorescent signal was monitored and representative images were taken at 2, 4, and 6 h after the addition of thimerosal (3). Dye exclusion is a robust direct test to measure cell viability but it is subject to the problem that cell membrane integrity is only compromised for later stages of apoptosis and necrosis. As a result, it is possible that cell viability might have been already compromised by apoptosis or some other process, but membrane integrity is still maintained. Alternatively, there might be some damage to membrane integrity from which the cell might recover at a later point (for example forming transient membrane pores during electroporation). Finally, this assay is not appropriate for measuring of non-lethal effects on cell viability that do not destroy cell membrane. Cellular metabolism measurement is a more sophisticated method of measuring cell viability without some of the limitations mentioned above that will discussed in the next part of our review. Kepp at al., Cell Death Assays for Drug Discovery, Nature Reviews Drug Discovery, 10, 221 (2011).